The EISB_M B-Line Series of compact managed switching hubs provide management functionality in situations where an extended temperature range of –40° to +75°C are expected — enabling them to perform successfully in outdoor applications. 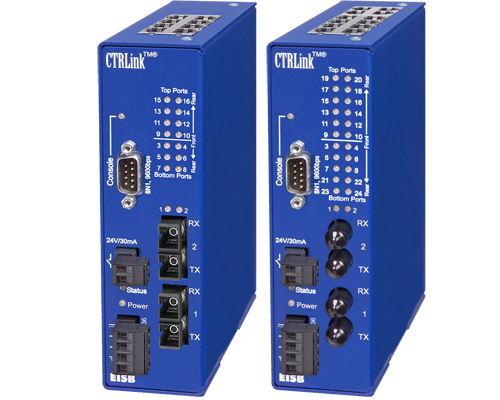 Within a constant form factor (panel space consumed) requiring only 1.75" of DIN-rail, these switches can support 8, 16 or 24 ports with copper and fiber/copper combinations in a rugged aluminum enclosure. Equipped with the conventional features standard in Plug and Play switches, the EISB_M B-Line Series is also designed with management features including RapidRing®, VLAN, trunking, QoS (Quality of Service), and SNMP (Simple Network Management Protocol). The switch learns port assignments by reading Ethernet frames and logs source addresses into a table which can hold more than 4,000 addresses in the 8-port unit, over 8,000 in the 16-port unit and more than 12,000 in the 24-port unit. With this information, it improves throughput by restricting traffic to only those ports party to a data exchange — while other data is simultaneously exchanged on other ports. Store-and-forward operation of frames is implemented using 256 kB of built-in memory in the 8-port unit, 512 kB of built-in memory in the 16-port unit and 768 kB of built-in memory in the 24-port unit. Only standard straight-through cables are needed to connect the copper ports to stations or another hub since the copper ports are Auto-MDIX compliant — meaning any port can function as an uplink port to another switch or end-station. In addition to one power LED, each port has an LED showing link/activity/data rate by color: green for 100 Mbps, yellow for 10 Mbps. Flashing indicates port activity. The EISB is shipped with a DIN-rail clip installed. If direct mounting to a sub-panel is desired, the DIN-rail clip can be removed and the attached mounting ears extended to provide panel mounting. The unit can be powered from either wide-range, low-powered AC or DC power sources. Redundant power connections are provided to accommodate back-up schemes.